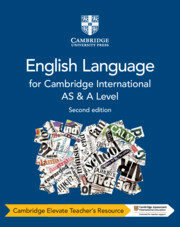 Updated and fully aligned with the Cambridge International AS & A Level English Language 9093 syllabus for examination 2021. 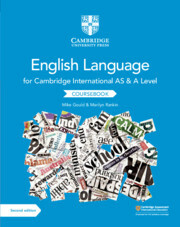 This coursebook helps students take an active approach to developing and applying the key reading and writing skills they need to succeed in their AS & A Level English Language course. In the first part of the book, for AS Level, students will learn to analyse and write different text types, from diaries and blogs to reviews, speeches and narratives. The second part supports A Level study, building on the skills students have learnt at AS level and applying them to four specialist areas of English: Language Change, Child Language Acquisition, English and the World, and Language and the Self. Contains annotated sample answers, scaffolded activities and self-evaluation sections that enable students to become independent learners. Packed full of engaging texts and images from around the world to inspire an awareness of how language works for many different purposes. Helps students to prepare for examination, with opportunities for assessment and step-by-step guides to different question types.